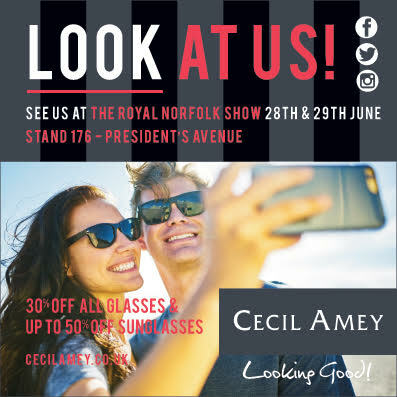 Cecil Amey will again be taking part at The Royal Norfolk Show on June 28th & 29th, we have a beautiful marquee lined up this year and we’d like to invite you to join us on the Cecil Amey stand to take the opportunity to see all our latest ranges of eyewear and also take advantage of some fantastic offers that are exclusive to the Show. There’s 30% off any pair of glasses and up to 50% off sunglasses. Plus, you can pick-up a voucher which will entitle you to 20% off all glasses or sunglasses in any of the eight Cecil Amey practices until the end of July 2017. We would be delighted if you would join us at the Show for a glass of fizz and to pick-up a bargain! You’ll find us on Stand 176, President’s Avenue. Hope to see you there!